London-based indie line Angela Flanders has launched Bleu de Chine, a new limited edition fragrance inspired by vintage Chinese textiles. Many years ago, when I was creating the perfume which became our very successful scent Earl Grey, as so often happens, a second equally interesting version appeared at the time. It was difficult to decide which version to go forward with, in the end I chose the rosier version with Palmarosa, buried deep in the heart. The other fragrance, with Lavender notes, I have always thought of as a Blue scent – Bergamot, Lavender & Patchouli. These last two ingredients, when perfectly blended together, create a third, indefinable scent – and that magic happened here. Seeing these lovely textiles I was reminded of my Blue perfume and thought what a perfect reflection of the cloth and patterns it would make, and so, at long last, it has been resurrected! 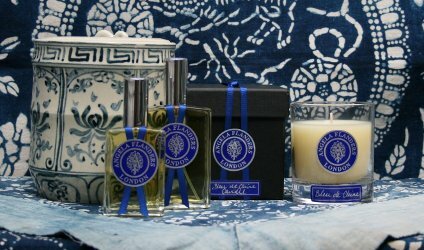 Angela Flanders Bleu de Chine is available in 50 and 100 ml Eau de Toilette and matching candle. Sounds lovely. Wish I could try it! I would never have thought of lavender and patchouli together. For a moment, admittedly, I mixed up Angela Flanders with Angela Sanders. But everything’s fine now! YES — I have a hard time typing this brand name! Want to try but with the patchouli, it would probably tip over too much on the masculine side for me but who knows.